„Freedom House, an independent international organization, announced that the status of Serbia in 2018 changed from free to the partly free country. We are witnessing significant and rapid centralization of power in the hands of one branch of government – the executive, and closure of institutions before the interests of the public. 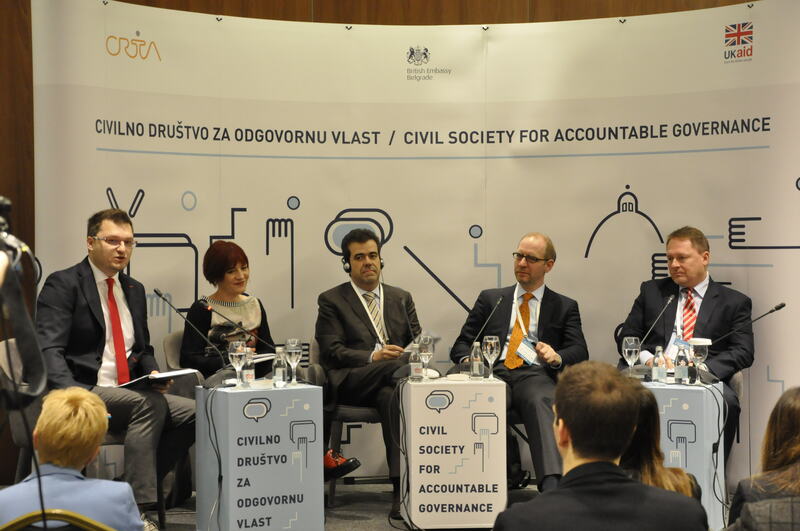 Institutions in Serbia and mechanisms established to protect citizens and public interest actually serve to fulfill some other interests in society”, Rasa Nedeljkov, CRTA Program Director, stated at the opening of the second day of the international conference “Civil Society for Accountable Governance“ in Belgrade. Filipe Marques, President of the Board of the European Association of Judges and Prosecutors for Democracy and Freedoms, reflecting on the crisis that democracy faces, raised the question of the type of reforms that would be able to improve democracy. “Being the most vulnerable of all three branches of power, the judiciary should be protected, since without the independent judiciary that safeguards citizens’ rights the democracy is not possible”, Marques stated. The conference also addressed the challenging media situation in Serbia, where media are increasingly used as tools to serve personal interests of those in power. “The media have abandoned their audience, the citizens of Serbia. This is the reason for citizens losing trust in the media, and consequently not feeling the need to stand and defend media. The former important role of the media as the fourth pillar of democracy has been replaced with their role of the first pillar of the government“, stated Journalist Danica Vucenic. “Serbia needs to understand that only with interested and citizens willing to act to change institutions and secure the rule of law, such changes would be achieved, because the state exists for its citizens, and not citizens for the state”, stated Florian Bieber, Coordinator at the Balkans in Europe Policy Advisory Group (BiEPAG) and a professor at the Centre for Southeast European Studies at the University of Graz. Particular attention at the conference was given to changes to the Law on Free Access to Information of Public Importance. “Since the access to information of public importance in Serbia was not poor, it would be better to keep the previous law in this area instead of adopting new solutions that contradict values of democracy, as they would allow companies financed from the public budget not to respond to requests for information of public importance”, stated Primoz Vehar, Senior Advisor to SIGMA. The conference concluded with the panel presenting the conclusions from working groups that covered five different areas determining for development of democracy: oversight and legislative role of the Parliament, the role and position of independent institutions, constitutional changes, free access to information of public importance, and protection of public interest and media pluralism. Novak Pesic, CRTA Program Coordinator, pointed out that citizens no longer have access to the Parliament through the existing mechanisms, and that efforts should be focused on strengthening ties between MPs and citizens, and restoring mutual trust. 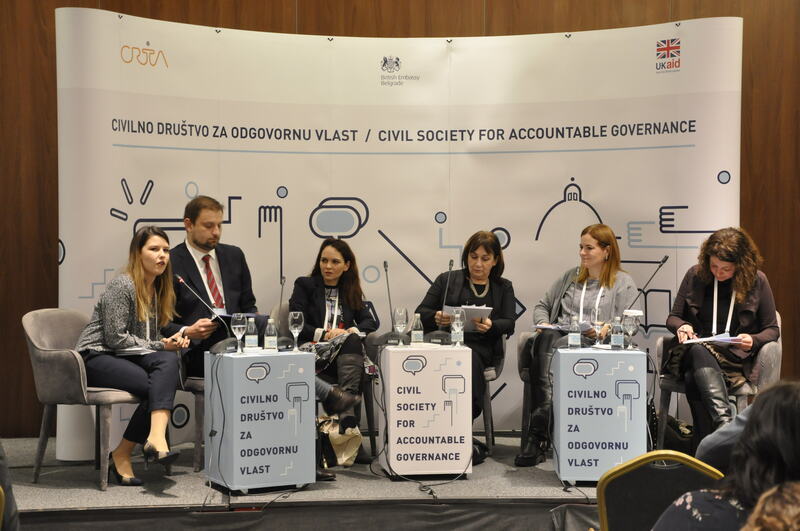 Milica Marinkovic, Senior Policy Analyst at the A11 Initiative for Economic and Social Rights, added that better cooperation and connections between institutions and citizens are needed, as well as greater transparency of institutions. Deputy Chair of the Managing Board of the Center for Judicial Research Vida Petrovic Skero emphasized that broader changes to the Constitution are absolutely necessary, since only partial constitutional changes would not lead to the needed harmonization. Zlata Djordjevic, Project Coordinator at the Transparency Serbia, stated that the Commissioner for Information of Public Importance and Personal Data Protection, as an independent accountability institution, should have the inspection authority, as well as the authority to initiate sanctions and penalties. In closing remarks related to the media scene, the Executive Director of the Slavko Curuvija Foundation Ivana Stevanovic stated that the bond between citizens and public media services is not functional, and that defining the media pluralism in terms of media content is necessary, as it is not sufficiently grounded in the law. The international conference “Civil Society for Accountable Governance“ gathered over a hundred local and regional experts to discuss findings of research in five key areas pertaining democratic progress, conducted jointly by CRTA, Transparency Serbia, Centre for Judicial Research, Slavko Curuvija Foundation and A11 Initiative for Economic and Social Rights, with the support from the British Embassy in Belgrade.